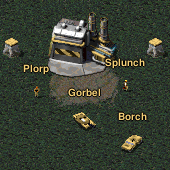 - Alpha map: Fixing the base layout, and moving the tiberium fields closer. - Bravo map: Fixing where the dead weapons factory/airfield re-inforcement transport flies in. - Buildings should leave behind a husk when they are destroyed. - GDI and Nod harvesters should respawn at the same time (airfield currently penalizes Nod for this). - Locking newly purchased vehicles for a brief period of time, so teammates cannot steal your vehicle (enemies always can). - Before the engine can support exiting another player's vehicle, I may be able to add an "Unload Passengers" button, available to all vehicle passengers (keeps the driver in the vehicle). - Map lobby option to rebuild destroyed buildings. - Map lobby options for victory conditions. - Adding Orca & Apache. - Adding a death cam. Im tried to play this map. Looking pretty nice. But TD doesnt have enough players to play it. Also Engineers cant disarm enemy's beacons and unmanned vehicle sometimes tried attack. A new version of the map is available -- I fixed the two issues you found, and a couple more. I agree it will be hard at times to find enough TD players. I am hoping on the weekend to get a bigger group going. This was a lot of fun, there are some issues but people like it. Rebuild buildings? Auto harvesters sometimes freak out and stop working, Options for fog should be restored. Anyway we keep playing and finding bugs. Nice work. The new version is a lot more unstable, just had 2 crashes, 1 random, 1 after placing nuke. There are issues with 0.92, so it's nice to see players on 0.90 today. I'll have a stable 0.93 out by tomorrow. I'm glad for the feedback and interest so far on this game mode. Please feel free to share any replays of the newer version when it's out. Spectating or replays are busted on 0.90. I'll be able to play this weekend, since timezones work against me right now. I apologize again about the crashes in 0.92. Before finishing 0.92, I had modified my engine to watch 0.90 replays -- which had the effect of breaking all Lua error handling. For balance, I'm watching replays and hearing feedback. I am interested in seeing how larger games play out. It is worth noting this map has a contrasting play-style with the TD mod. I'm glad people are trying and also enjoying this map. Thanks everyone. Right now caught a bug. I was an engineer and was on low heals when entering humvee. I get at base there appears another me. im tried to exit from humvee and then game crushed. I watched the replay of that game. Your engineer was killed but its dead body managed to enter a humvee (that shouldn't happen). So when you unloaded the transport, the game crashed. This is an engine issue so a fix will rely on a new OpenRA release. But I can add a check to the map that should prevent this particular crash. Thanks everyone who played today it was fun and there's some definite areas for improvement. Edit: Moved roadmap to first post. 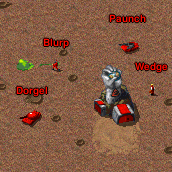 bug .93:repairing ore trucks prints "ore truck under attack"
I've updated the original post with a small roadmap.